Agile methodology builds trust with stakeholders and keeps them involved in setting goals and priorities — but it's not necessarily the right approach for every project. Here are some best practices for agile success. The business intelligence team at George Washington University in Washington, DC, has changed the way it works with partners across GWU's business and academic units. Rather than settling on all of a dashboard project's parameters up front, they now work in two-week "sprints" and have a quarterly product release cycle. "During that transition from one release to the next, we meet with our business intelligence guidance team made up of community members across campus," said Mike Wolf, director of business intelligence. "They tell us what the priorities are for the next release and we follow that process all the way through." More prevalent in the private sector than in government or higher education, "agile" project management breaks software projects up into short sprints of a few weeks. The traditional software development approach, in which requirements and budgets are firmly established upfront and each phase of a project is completed before moving to the next, is referred to as "waterfall." The goal of agile is to end up with fewer failed software development projects in which the internal customers are dissatisfied with the results. In April 2018, GWU's BI team celebrated its 100th sprint, and the team members reflected on some things they have learned. "One is that working in agile has provided a broader sense of ownership and people get better at sharing their expertise with others," said Jelena Roljevic, assistant vice president for business intelligence and Enterprise Information Services (EIS). "We no longer have folks who are strictly business analysts or visualization developers. People get cross-trained in this culture so it reduces that friction of people not letting others into their space." One key to success was adding a third requirement in deciding which projects to take on in an agile fashion. The first two are that projects are operationally important and that there is available data, Roljevic said. "The third leg has to be whether the organization is ready to engage. If any of those three criteria are not in place, we don't engage." 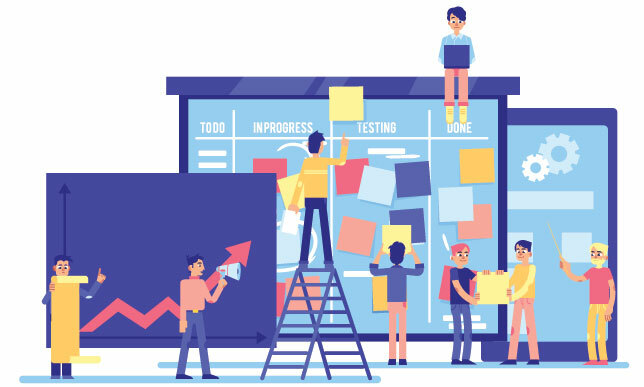 Christine Greeves, who has been director of information technology project and portfolio management at GWU for less than a year, explained why agile isn't as widely adopted in higher education as in the corporate world. "We have a lot of legacy systems and fixed budgets, so we have to ease our way into it," she said. "The key is applying the methodology to the right kind of projects, not just across the board. You have to have the right timing and the right work. For instance, if it is enrollment season, you don't want to do agile work on the enrollment system. You look for opportunities and when you find the right projects you pounce on them." Greeves added that she has been impressed by how the agile movement has spread from the BI team to other areas of IT. The EIS team, the web services team, the Sharepoint services team and the library are all adopting the methodology. Last fall, GWU created an agile steering committee that included members from IT as well as individuals from other groups on campus who could help IT think about the best implementation practices. "We invited core members of the university community from both the academic and business sides, and representatives from the libraries," Wolf said. He admits that they occasionally struggle with getting effective participation from customers who have a lot of other irons in the fire. The people they deal with fall into two categories, Wolf noted: "The first is people we have dealt with before in this process and they pick it up quickly. The second involves customers we have not intersected with yet, so we have to help them prepare to work in an agile fashion. We do some training to introduce concepts and the identification of roles. We have to know who we are going to sit down with most frequently and who has the authority to make decisions about building the backlog of what is important." Roljevic said that when agile was first introduced in business intelligence, the business people quickly realized the benefit of having direct input on how a dashboard might look. "At the beginning some people were skeptical, but they soon realized that every two weeks they would have an opportunity to shape that product. They also realized that this allows them to get their top priorities met and they can always re-prioritize. They can get the most important things done." A few years ago, Harvard University Information Technology (HUIT) began experimenting with agile for a small number of key strategic programs that needed to deliver business value quickly through iteration. In e-mailed responses to questions from Campus Technology, several HUIT members made observations about their experience to date. "Agile better meets our need to show our work to our business partners and provides opportunities to make changes along the way — something that the waterfall method didn't always allow for," said Tamara Larsen, infrastructure technology services director, DevOps. "Once agile was established in those strategic programs, other teams began to see the value and then began to adopt agile as well." The my.harvard student information system was one of the first programs to adopt agile methodologies, because it enabled HUIT to balance the competing demands of diverse constituencies in a time of rapid change to academic programs, in addition to a complex, phased roll-out strategy, explained Jason Shaffner, managing director of administrative technology services. These factors necessitated tradeoffs between delivering new features and responding to operational support needs. "Agile helped us to create structures and processes for ongoing prioritization and greatly enhanced the transparency for business stakeholders to understand the status of their requests in the broader context of the program," he said. The agile methodologies allowed HUIT to release incremental changes on a continuous basis, synchronized to each milestone of the academic year. "The process — and the trust it allowed us to build over time with stakeholders — also enabled us to emphasize the highest-value features and to avoid some of the feature bloat common to ERP system implementations," Shaffner said. Agile does require some training. Harvard IT leadership created an in-house training program, the IT Academy, a multi-year development program designed for Harvard IT professionals by Harvard IT professionals. "Through the IT Academy, we can offer all of our IT staff across the university an opportunity to learn the basics of agile, and dive much deeper to become experts who can teach others," said Deirdre Schreiber, senior training program manager. HUIT also has an Agile Community of Practice and an Agile Working Group to provide guidance to those working on new training content that can be used to educate other Harvard IT staff. Not everyone in the organization is going to embrace agile right away, Schreiber added. "HUIT provides numerous opportunities for people to experiment with how they work, and supports them even if they fail. Over the long term, this culture has enabled HUIT to succeed by learning what works." The Web and Technology Services team in the Division of Student Affairs at California State University, Northridge has turned to agile in working with a few of its internal customers, according to Paul Schantz, the team's director. "We had a couple of customers we were building applications for using waterfall and it didn't really work out. We were setting milestones that were not realistic," he said. "We adopted agile for a couple of these projects serving students with disabilities, and the engagement with the customer is what ended up selling it. The people who were direct stakeholders were engaged every step of the way. They became the biggest cheerleaders for this process. It is a fundamental realignment of the IT-customer relationship. The customer is driving this." Schantz shared his team's success with a university vice president, who was impressed enough to host multi-day training sessions for the whole campus. "That was to seed the idea across campus. We were under no illusions people would start adopting it en masse," he said. But one department liked it so much that when they redesigned office space they created a 'scrum room.'" He cautioned, however, against IT leadership getting caught up in taking shortcuts or using buzzwords. "They will say agile, but for them it just means you are working faster vs. actually using it as a methodology for getting things done."